Image Credit: ESA/Hubble & NASA"
At first glance, this image is dominated by the vibrant glow of the swirling spiral to the lower left of the frame. 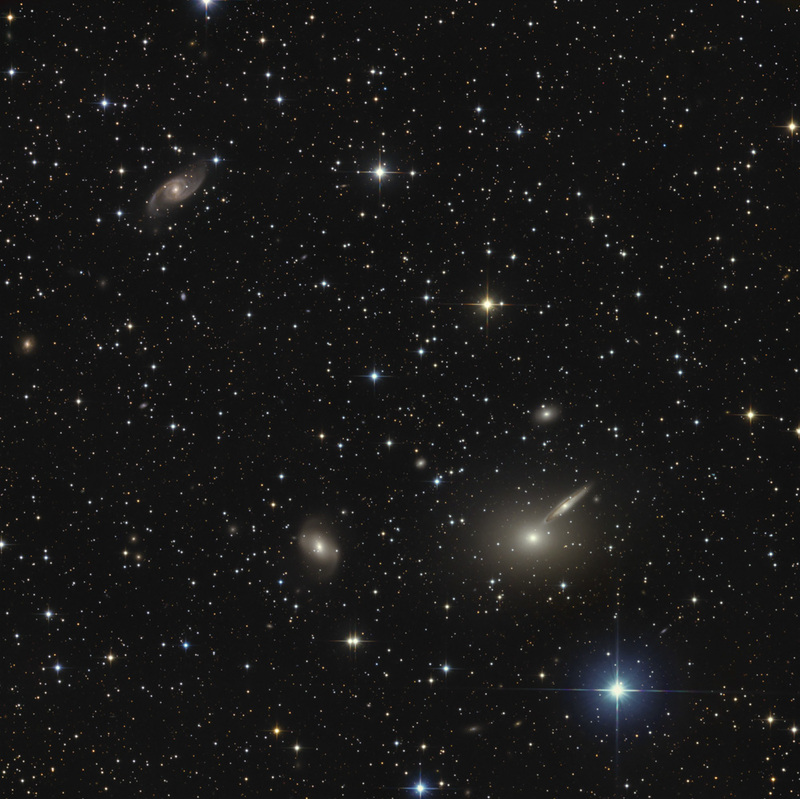 However, this galaxy is far from the most interesting spectacle here — behind it sits a galaxy cluster. 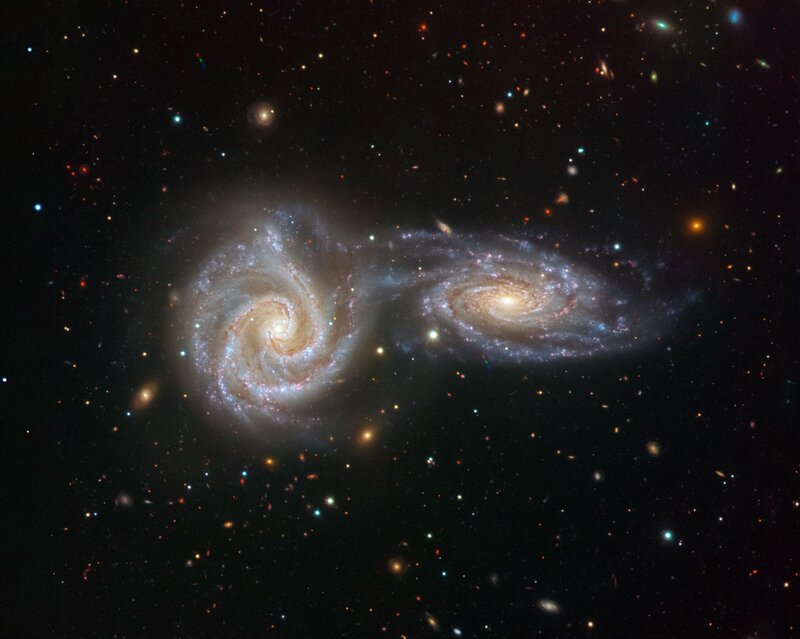 Galaxies are not randomly distributed in space; they swarm together, gathered up by the unyielding hand of gravity, to form groups and clusters. The Milky Way is a member of the Local Group, which is part of the Virgo Cluster, which in turn is part of the 100 000-galaxy-strong Laniakea Supercluster. 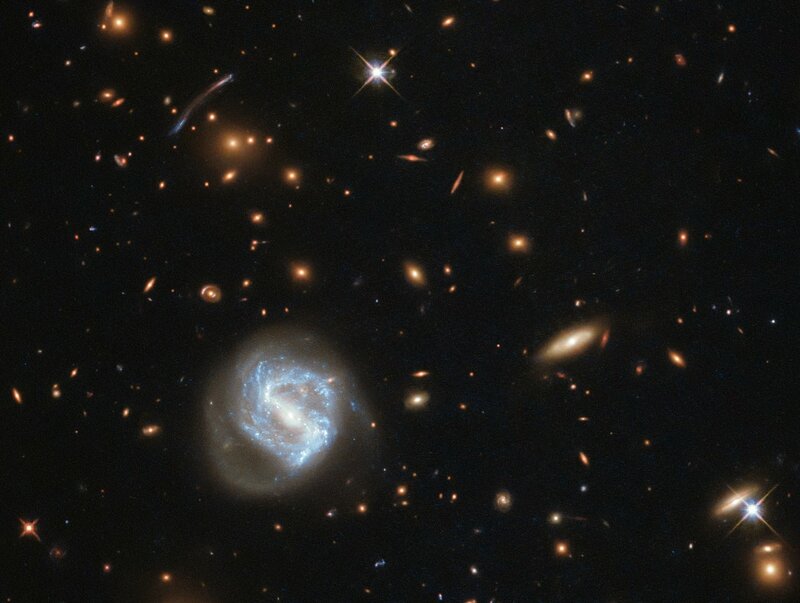 The galaxy cluster seen in this image is known as SDSS J0333+0651. Clusters such as this can help astronomers understand the distant — and therefore early — Universe. 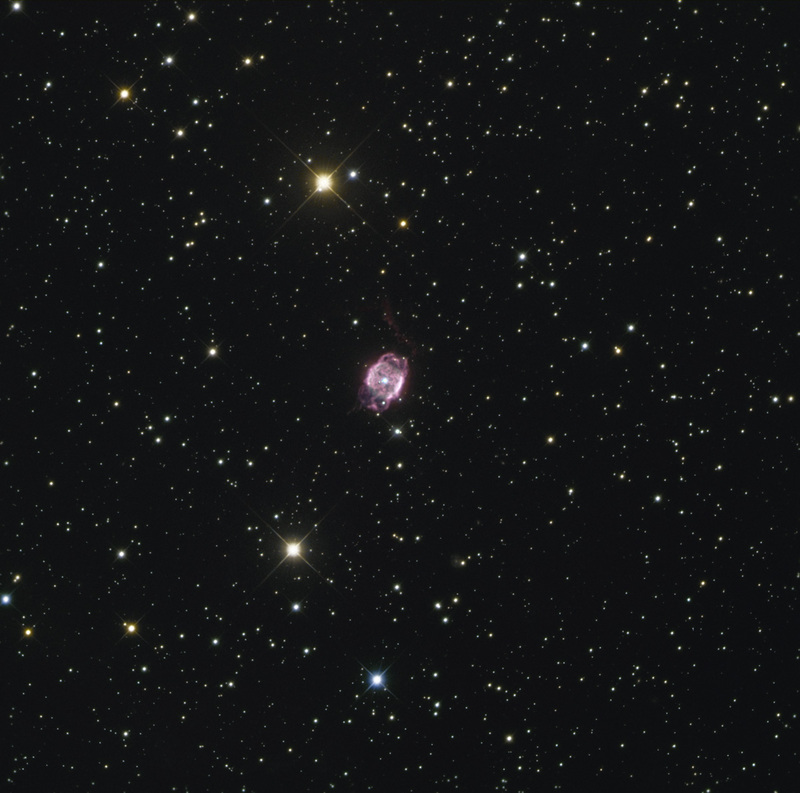 SDSS J0333+0651 was imaged as part of a study of star formation in far-flung galaxies. Star-forming regions are typically not very large, stretching out for a few hundred light-years at most, so it is difficult for telescopes to resolve them at a distance. 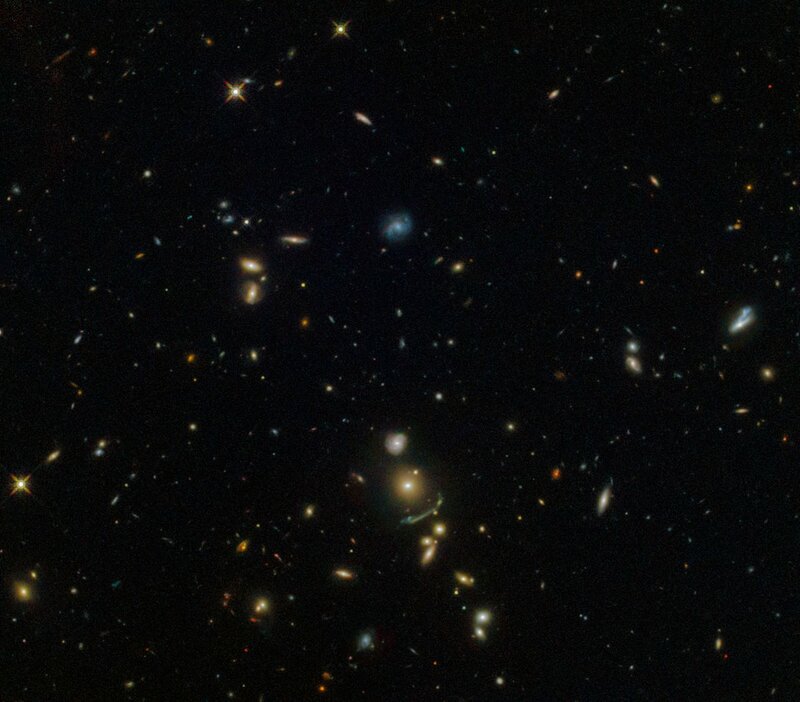 Even using its most sensitive and highest-resolution cameras, Hubble cannot resolve very distant star-forming regions, so astronomers use a cosmic trick: they search instead for galaxy clusters, which have a gravitational influence so immense that they warp the spacetime around them. 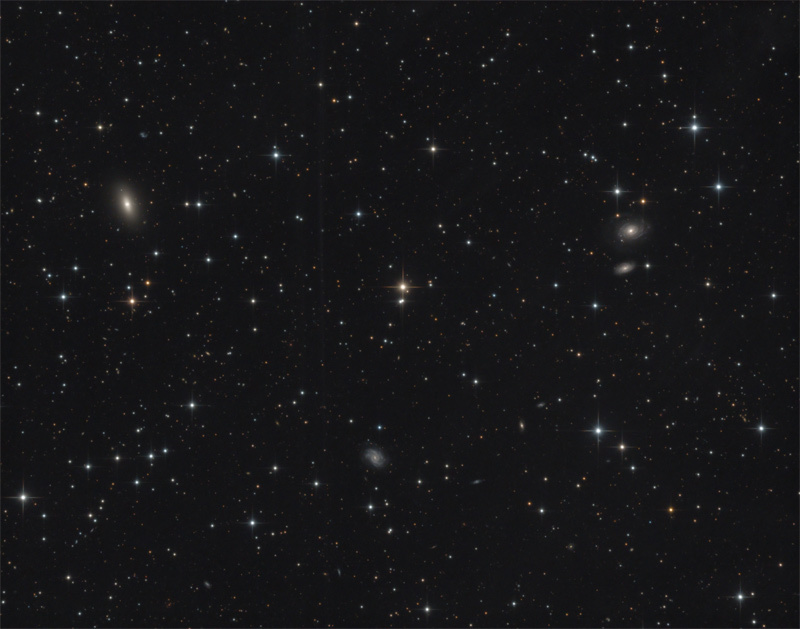 This distortion acts like a lens, magnifying the light of galaxies sitting far behind the cluster and producing elongated arcs like the one seen to the left of centre in this image. This ESO Picture of the Week shows the centre of a galaxy named NGC 5643. This galaxy is located 55 million light-years from Earth in the constellation of Lupus (The Wolf), and is known as a Seyfert galaxy. Seyfert galaxies have very luminous centres — thought to be powered by material being accreted onto a supermassive black hole lurking within — that can also be shrouded and obscured by clouds of dust and intergalactic material. As a result, it can be difficult to observe the active centre of a Seyfert galaxy. NGC 5643 poses a further challenge; it is viewed at a high inclination, making it even trickier to view its inner workings. 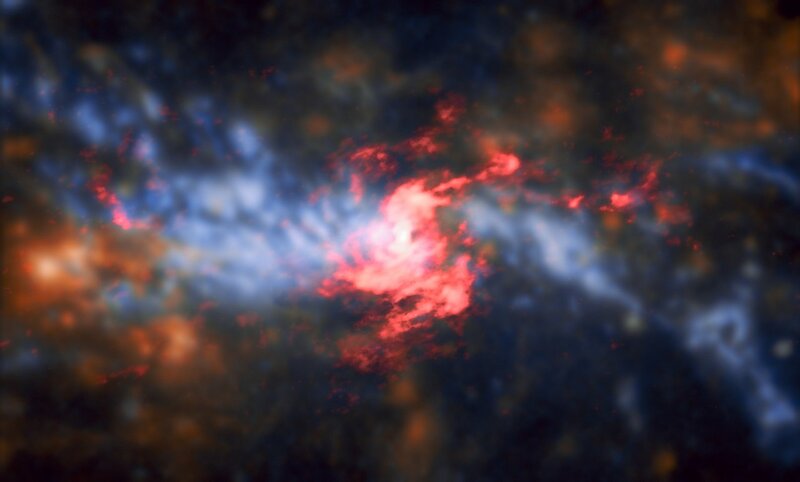 However, scientists have used the Atacama Large Millimeter/submillimeter Array (ALMA) together with archival data from the Multi Unit Spectroscopic Explorer (MUSE) instrument on ESO’s Very Large Telescope to reveal this view of NGC 5643 — complete with energetic outflowing ionised gas pouring out into space. These impressive outflows stretch out on either side of the galaxy, and are caused by matter being ejected from the accretion disc of the supermassive black hole at NGC 5643’s core. Combined, the ALMA and VLT data show the galaxy’s central region to have two distinct components: a spiraling, rotating disc (visible in red) consisting of cold molecular gas traced by carbon monoxide, and the outflowing gas, traced by ionised oxygen and hydrogen (in blue-orange hues) perpendicular to the inner nuclear disc. Galaxy clusters are giant structures containing hundreds to thousands of galaxies with masses of about over one million billion times the mass of the Sun! SDSS J1156+1911 is only roughly 600 billion times the mass of the Sun, making it less massive than the average galaxy. However, it is massive enough to produce the fuzzy greenish streak seen just below the brightest galaxy — the lensed image of a more distant galaxy.